Milkeed oil has potential use in sunscreens because it can protect skin from two types of ultraviolet (UV) radiation. 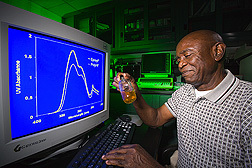 Chemist Rogers E. Harry-O’kuru studies UV radiation absorbance spectra of modified milkweed oils. Milkweed is popularly known as a favorite food of the monarch butterfly caterpillar. Historically, though, farmers considered milkweed a noxious weed. Today, some farmers actually cultivate milkweed for its soft, silky floss, which is used commercially as a hypoallergenic filler in high-end pillows, comforters, and jacket linings. But floss isn’t the only useable portion of this native American plant, which grows throughout the country. In studies at ARS’s New Crops and Processing Technology Research Unit in Peoria, Illinois, chemist Rogers E. Harry-O’kuru is experimenting with new, value-added uses derived from unsaturated oil in the seed of common milkweed, Asclepias syriaca. Harry-O’kuru’s analysis of the waxes and different fatty acids in the oil shows it has potential use as a base material in sunscreen, cosmetics, and skin- and hair-care products, including moisturizers and conditioners. Many of today’s sunscreens use chemical filters or blocks to protect skin from two types of ultraviolet radiation, UV-A and UV-B, at wavelengths of 290 to 400 nanometers (nm). The effects of UV-B exposure are usually temporary—an example being the sunburn a careless beachgoer must endure for a few days. Repeated or prolonged exposure to UV-A radiation—such as that experienced by lifeguards or road crews—can cause premature aging and skin cancer. The filters and blocks work by absorbing or scattering such radiation before it penetrates and damages skin. Recently, interest has grown in sunscreen and cosmetic products that not only protect skin, but nourish it. Harry-O’kuru’s milkweed-oil-based sunscreen aims to fill the bill on both counts. It contains natural antioxidants, such as tocopherols, and cinnamic acid derivatives like ferulic acid, which occurs naturally in many plants and is highly absorbent of UV rays. A key step in the process, which ARS has patented, is using zinc chloride to catalyze the conversion of milkweed oil’s triglycerides into the UV-absorbing cinnamic acid derivatives. In laboratory tests, the derivatives strongly absorbed UV rays in the range of 260 to 360 nm, wavelengths that can damage skin. The milkweed-oil product accomplished this at very low concentrations (1 to 5 percent by weight)—a range far below that approved for today’s topical skin formulations, says Harry-O’kuru. Harry-O’kuru says his current sunscreen compounds are clear liquids, but gels, creams, sticks, and aerosol sprays are also possible. The sunscreen’s unique combination of fats and waxes may qualify it as biodegradable and may keep it from washing off during a swim. Besides skin- and hair-care products, the UV-absorbent formulation could also be tailored for use in epoxies, paints, or other industrial applications. Says Harry-O’kuru, “We’re hoping a stakeholder will become interested in developing the technology further.”—By Jan Suszkiw, Agricultural Research Service Information Staff. Rogers E. Harry-O’kuru is in the USDA-ARS New Crops and Processing Technology Research Unit, National Center for Agricultural Utilization Research, 1815 N. University St., Peoria, IL 61604; phone (309) 681-6341, fax (309) 681-6524. "Milkweed: From Floss to Fun in the Sun" was published in the February 2009 issue of Agricultural Research magazine.